Business globalization and the increased virtualization of employees call for the need to collaborate and exchange large amounts of data with employees, partners or clients within and outside the firewall. Today content collaboration platforms and MFT solutions are offered by multiple vendors, however, Thru is the only vendor that offers both in one tightly integrated platform, which is why the world's top companies like Dell EMC, VMware and VISA choose and trust Thru every day. 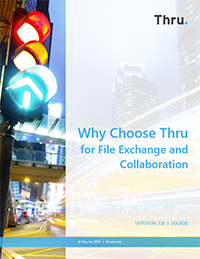 Read Why Choose Thru for File Exchange and Collaboration eGuide.